Finance should play a strategic role in driving performance; however, static planning with manual spreadsheets and processes isn't conducive to advanced budgeting and forecasting. Static plans lack buy-in, have inaccurate data and quickly become outdated. Instead, finance teams should embrace active planning – processes that are collaborative, comprehensive, and continuous. See how the Adaptive Suite can enable active planning to solve your most important FP&A challenges. Free yourself from static budgeting and increase productivity by more than 70% with Adaptive Insight's centralized plans, actuals, forecasts, calculations and cell notes. 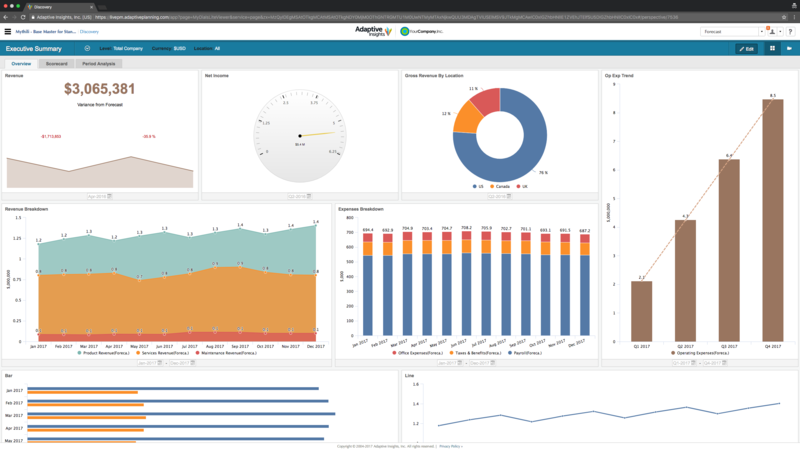 With Adaptive Insights intuitive and interactive self-service reporting, you can slice and dice management and financial reports and easily drill down into the details. In Adaptive Insights you can create easy and personalized interactive dashboards, data visualizations and charts to show a complete story using financial and operational data. Why Kraft and Adaptive Insights? Kraft was the very first Adaptive Insights Partner. Kraft's most recent award was the 'Partner Excellence Award' from Adaptive Insights. The Kraft Team has been working with Adaptive Insights customers for over 10 years and has a deep level of expertise with both ERP products and Adaptive Insights. "Adaptive Insights has allowed us to save time and increase our accuracy. Having a cloud-based system with centralized data that multiple employees can access simultaneously has been a huge plus for us." "With Adaptive Insights, our accounting team is more efficient and has the ability to review data at a much more detailed level. From productivity and collaboration to time management, it’s been amazing." “With the cloud-based software, we can bring more people into the process, which makes our forecasting and budgeting more accurate. Communication throughout the company is better and we are all on the same team."